Today, Jesus visits the home of two sisters and causes an upheaval. Why? 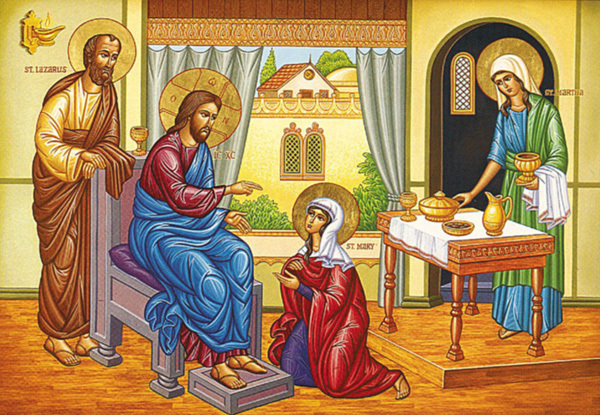 St. Luke tells us of a visit Jesus made to a village where “a woman whose name was Martha welcomed Him.” It must have been a comfort to Jesus to receive a welcome like this. He met many different responses on His journey from Galilee to Jerusalem—some not so warm (see Lk 9:52-53; 10:13-16, 25). Perhaps He was relieved at the prospect of a cordial home visit. However, rather than the presence of Jesus bringing a blessing to Martha’s home, there was trouble right away. When Jesus arrived, Mary, Martha’s sister, simply “sat beside the Lord at His feet listening to Him speak.” It was probably the custom to spring into action upon receiving a guest in the home in that time and place—offering water to clean feet dirty from desert dust, preparing a meal, etc. Why did Mary choose, instead, to drop everything and be quiet? Was there something about Jesus that assured her He was no ordinary guest? Were His words so compelling that she didn’t want to miss a single one of them? Did she sense immediately that the first priority in His visit to her home was to pay attention to everything He wanted to say to the people in the room (assuming His disciples were with Him)? Are we surprised by this boldness? Imagine telling Jesus, the Guest, what He ought to do for Martha, the hostess. As inappropriate as this was, Jesus’ response to the harried woman is full of tenderness: “Martha, Martha, you are anxious and worried about many things.” Jesus is more concerned for her than He is about the service she was attempting to offer Him. He diagnosed the heart of her problem—anxiety and worry. She was entirely focused on the project at hand, the work she thought was expected of her. It filled her with distress and then with fault-finding. She wanted to do something for Jesus, but perhaps it came out of a sense of duty, or self-regard, or just habit. Whatever the source, Jesus needed to help her out of it. What would have been a better way for Martha to receive this visit from Jesus? He tells her quite directly: “There is need of only one thing. Mary has chosen the better part and it will not be taken from her.” When Jesus comes to visit, when we invite Him into our lives as Martha invited Him into her home, the best response is to stop, be still, and listen carefully to what He has to say. The Guest gets all the attention first. There will be time to do something for Him, of course, but first He must do something for us. Mary understood that right away. We can assume that after Jesus’ gentle correction, Martha did, too. Possible response: Lord Jesus, anxiety and worry are always signs that I have forgotten the one thing needful. Please help me remember this. Here we have a story of the patriarch, Abraham, offering energetic hospitality to three mysterious visitors—clearly a divine visitation. This story was well-known to the Jews and very likely helped form the tradition of hospitality among them even down to Jesus’ day, as we see reflected in the Epistle to the Hebrews: “Do not neglect to show hospitality to strangers, for thereby some have entertained angels unawares” (Heb 13:2). Was Abraham’s response to his visitors any different from Martha’s? Well, we can see that Abraham was entirely focused on his guests. Notice that first he asked their permission to offer them the usual services of hospitality, including the preparation of a meal. Then “the men replied, ‘Very well, do as you have said.’” Would Jesus’ visit to Martha and Mary have turned out differently if Martha had first asked Jesus if He wanted anything from her household? Perhaps He would have told her right away to simply sit with Mary and listen for awhile. The mistake she made was taking charge of the situation, forgetting to focus on her Guest. Thus, Abraham becomes an excellent example of how to receive a Divine Visitor. Even though he bustled around in lots of activity, he did it with the approval of his guests. Humility and hospitality should never be separated. Possible response: Heavenly Father, please help me have the focus, humility, and then the energy of Abraham when I am in Your presence. St. Paul gives us a wonderful perspective on the sufferings we will experience as we serve the Lord. Had Martha been asked by Jesus to work hard on her hospitality, she could have responded to the burden of it in the same way St. Paul did to his sufferings: “I rejoice in my sufferings.” How could he do this? He understood the glorious mystery of the Gospel: “Christ in you, the hope of glory.” Whatever we do for Him in our bodies that results in suffering is how we fill up in our flesh “what is lacking in the afflictions of Christ on behalf of His Body, which is the Church.” All that is “lacking” in Christ’s afflictions is the part He asked us to share when He invited us to take up our cross daily and follow Him. What a difference this makes in our bodily suffering! Of course we can rejoice. Possible response: Lord Jesus, to rejoice in my sufferings seems so otherworldly. I will need your help every single day to do it.